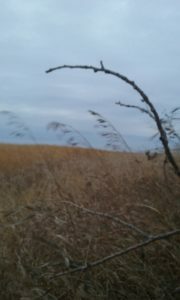 I looked out over a remnant of wild grass surrounded by groomed farmland. The air was still. The evening sky was cloaked with the threat of winter. Thin clouds speared across the horizon. It was quiet except for an occasional pickup which rumbled down the distant county highway. I had a tag to fill and this conservation section held promise in my late season hunt. 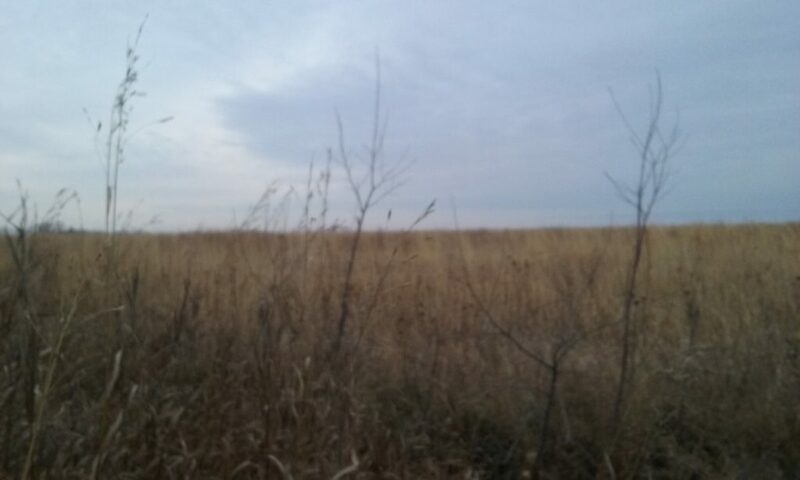 A large oak, part of a single tree line, shielded my back and the prairie hedged me in on either side. A steep ditch dropped away at my feet and rose up to the sod which was ten feet lower then my perch. I waited. A hawk cruised over the slender stalks and lighted on a branch just above my shoulder. I turned and watched in wonder. It scanned, twitched its head, and was gone. I realized it was hunting too. Fast. Silent. Effortless. Lethal. Fifty yards to my right, the sound of leaves crunching under light hooves jolted me back to my deer stand. I fought the urge to turn. Gradually, I sifted my gaze. Two does and two yearlings stood motionless. They scanned their feeding grounds for a good five minutes before feeling safe. Eventually the deer proceeded, but on high alert. One doe melted into the cover, the other turned left, followed by the younger, and hugged the ravine which lead toward me. My heart quickened. It was a tedious process. The trio stopped to nibble several times but steadily drew closer. Within bow range now, directly in front of me I prepared. 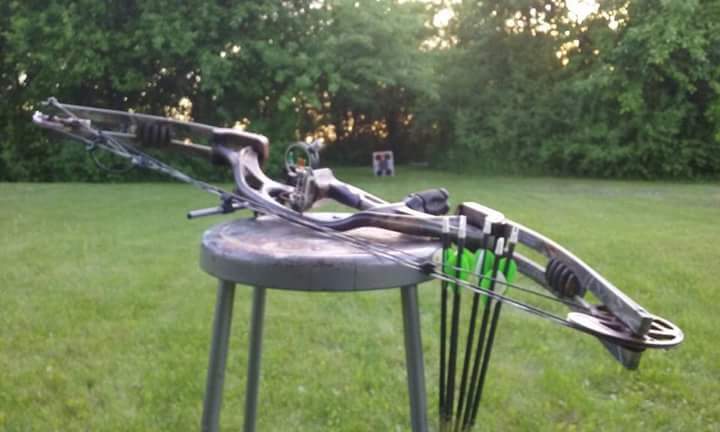 Gently, slowly, I started to lift my bow, and planned to wait until the animal walked past me for full draw but my slight movement was detected, I was busted. 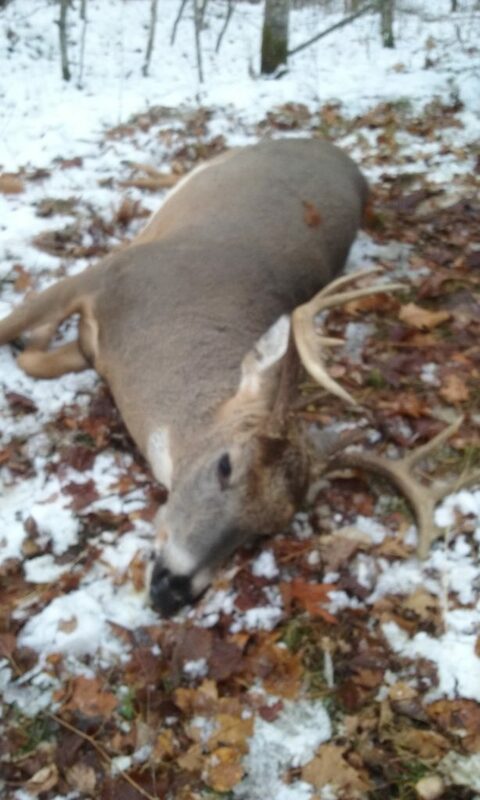 The seasoned Whitetail stomped and snorted, I held. The doe stomped again, I held still, with hope of a second chance. The wily creature walked off and disappeared into the tall cover, snorting several more times as it circled around. I knew the game was over. I finally relaxed and immediately replayed the scenario in my head. I had rushed my first move. Ground hunting is intense and rewarding, but small mistakes often leave me frustrated. The two yearlings stood there for many minutes and wondered what mama was doing. I was tempted, but did not take a shot. Day slipped away and finally the youngsters disappeared into the shadows. I plodded back over the hard ground, black against the dark sky. Short broken stalks of corn lay scattered amidst the harvested plot. Illuminated clouds were draped over the faint sun like curtains stretched over a soft flame. The vacant gravel road invited me back home as evening pushed the last faded color into night. 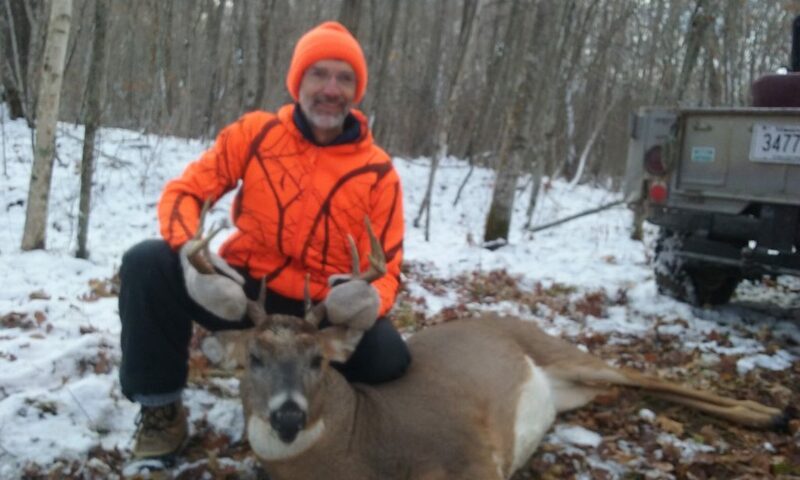 The route you take to your hunting area can determine the success you will have. 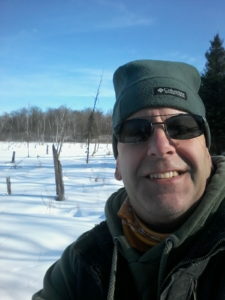 Busting brush, hiking to close to a bedding area, or being sighted by deer can all add up to a nice walk in the woods. 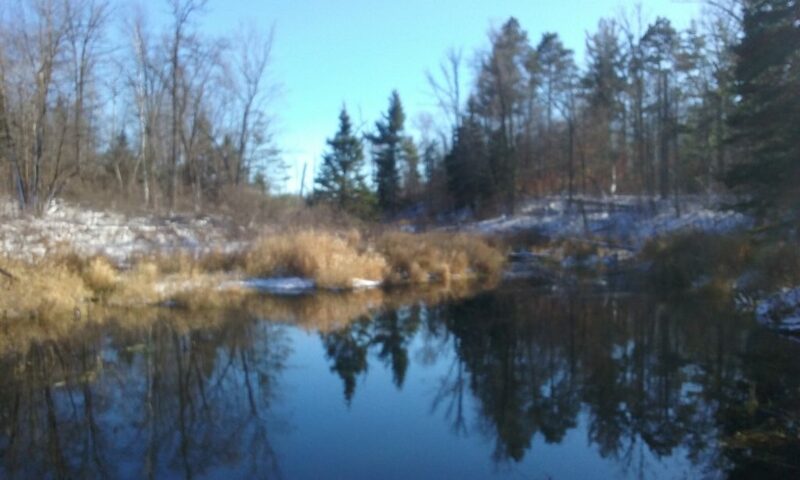 In the last blog I wrote about using beaver dams as one way to reach remote spots and hopefully avoid detection, but another approach is using open water. Water access can be a very effective way to enter buck havens that are difficult to reach by foot. 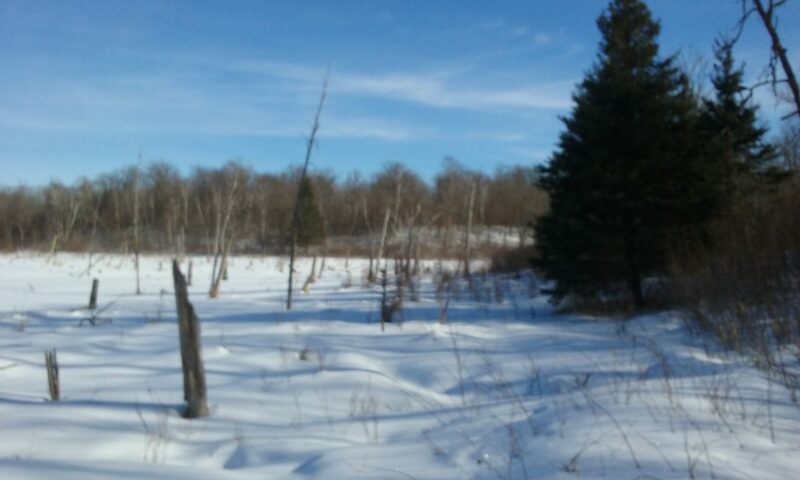 Today I spent a morning on the Tamarac Refuge in west central Minnesota with my X-C Skis doing some off-trail skiing and spring scouting. I found a beautiful spot for a canoe-in hunt that would be virtually impossible walking to without alerting every deer in the woods. 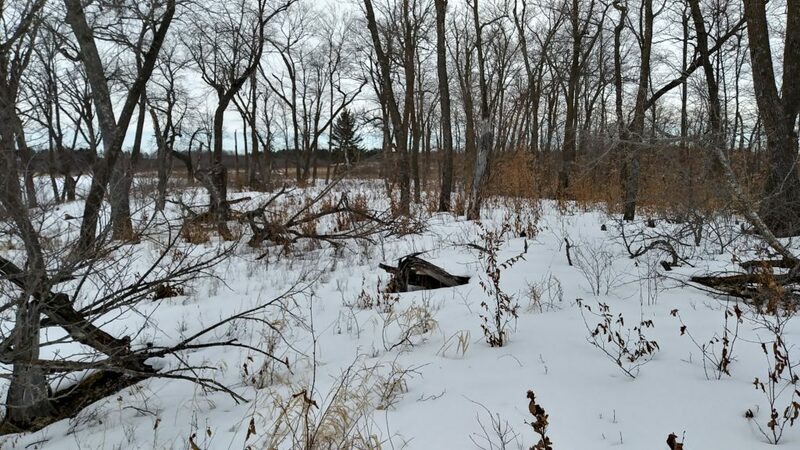 The site offered a long narrow, thirty to fifty-yard strip of open hardwoods, bordered by a tall shoreline on one side, and a big slough structure on the other side. On either end of this corridor was a tangled mess of brush and marsh making the high ground a perfect sanctuary to float into. The snow was compacted from several days of a warm weather melt. I glided across the firm covering like an Otter. Trumpeter Swans and Geese signaled the soon arrival of spring. An Osprey circled, fainted a dive, and flew on. 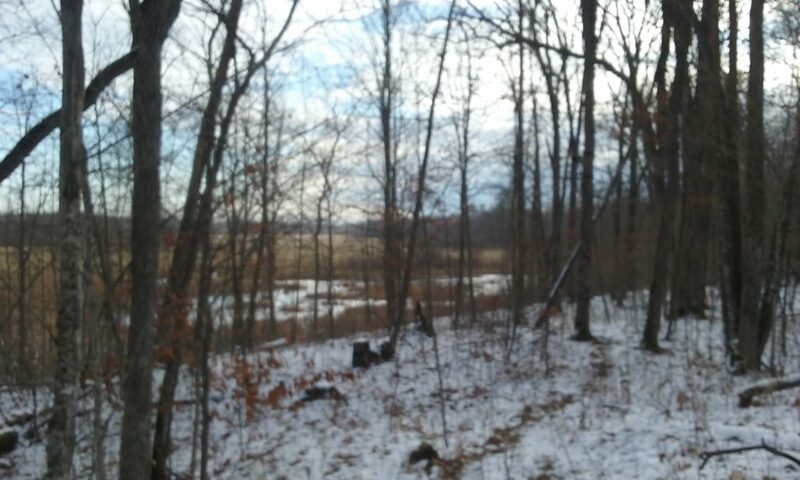 I approached Tamarac Lake along a tree-line which was hemmed in by an encroaching meadow. The local engineers had been active during the long winter months. 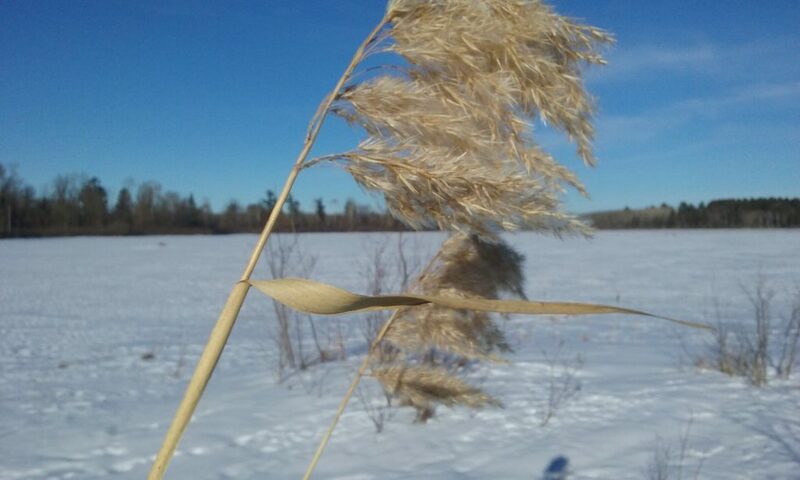 I slid through cattails which shot up from the ice, remnants of last summer’s growth, and onto the welcoming shoreline. I immediately acknowledged this hunter’s paradise and began making mental notes of down-falls for ambush cover. I also took note of landmarks to guide my canoe for the up-coming bow season. A boat access, primarily used for duck hunters a half mile away would be my entry. I told myself this was going to be good. I would be able to paddle in undetected, step onto the shore, and literally set up five to ten yards from the water and watch this band of old growth for passing deer. As I skied down the mix of hardwoods, an old bored-out tree trunk captured my attention. Once a sturdy timber, it now displayed the weathered signs of erosion and the woodpeckers handiwork. All was quiet except for a steely winter wind that haunted the empty forest. The lonesome quiet held secrets of a thousand passing seasons trapped by the silence of cold. A sense of wilderness enveloped me. Discoveries in the deer-woods make the anticipation of another hunting season come alive. I enjoy my scouting trips and they allow me to not only study deer behavior, but also learn new or over-looked places to hunt. These are treasures to me, and the times I get out and explore are an integral part of my hunting experience. I hope they are for you too. Patience and perseverance are vital in hunting, and in life. Slow down, be aware of your surroundings, and act decisively when the opportunity arises. The vast stretches of North American wilderness is home to the forest engineer. 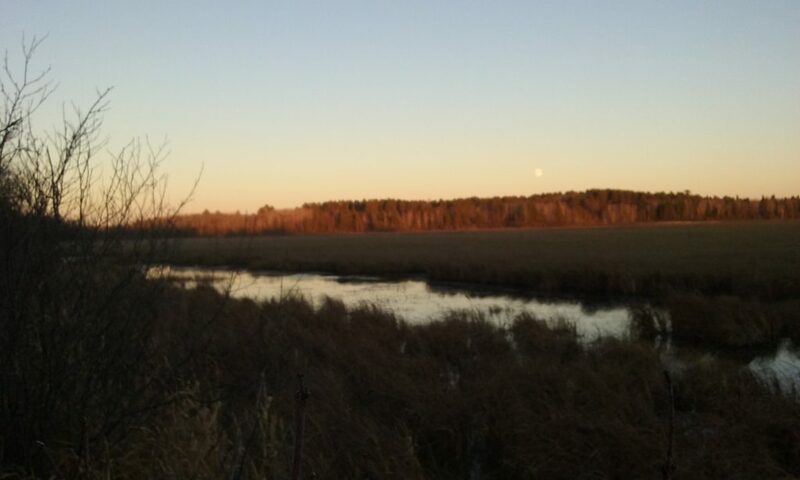 In my corner of this beautiful country, thousands of sloughs, creeks, and water-ways, scattered in between the Northern Minnesota Lakes provide a perfect habitat for the industrious beaver. 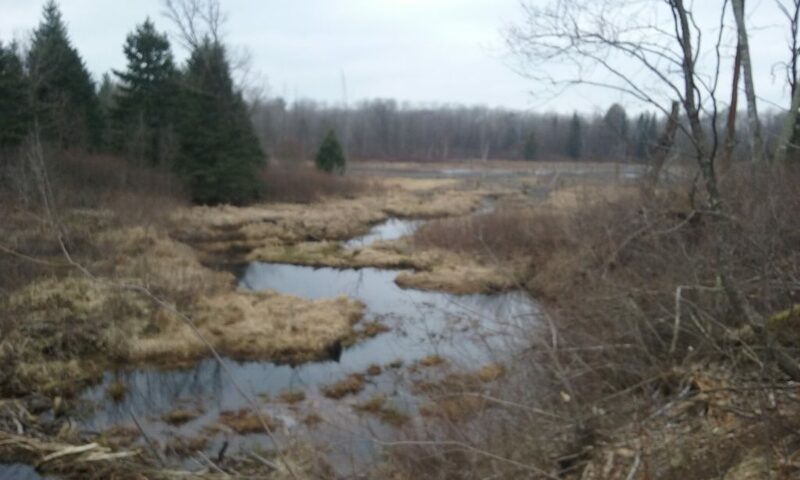 I have discovered one advantage to the many beaver dams in my region when it comes to deer hunting, they offer excellent bridges into remote areas. Most hunters do not make the effort to navigate these crossings. But I enjoy locating the dams on google earth and hiking to them during my spring scouting trips. Accessing these links during bow season opens up miles of intersecting swamp country, and leads to large tracts of back-woods hunting land which are virtually untouched. On the last day of our 2017 Round Lake Bow Camp I slipped across one of these connections to get into a favorite hunting spot. In the following lines I will re-count the events of that afternoon. 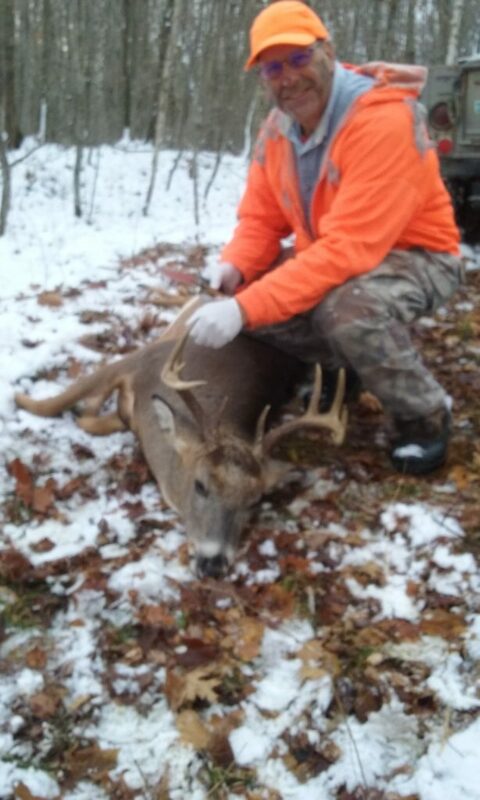 After arriving back at the cabin I helped Bill hang the ten point he arrowed that morning. 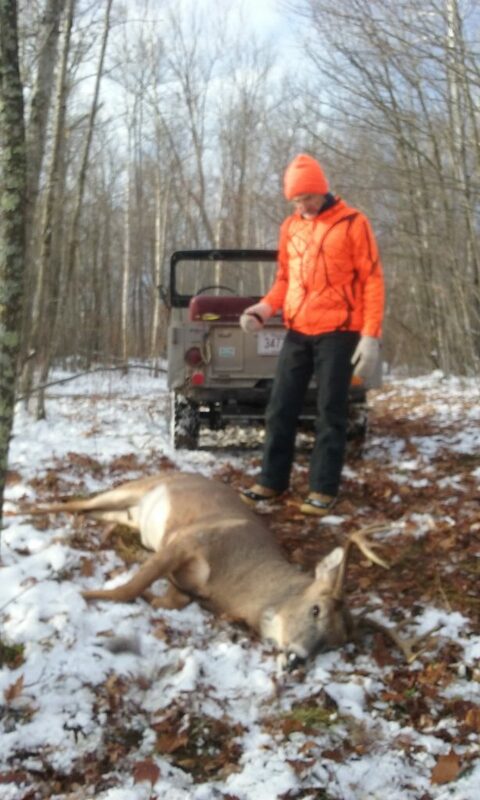 While he was skinning the old buck I had a quick lunch and readied myself for the afternoon hunt. 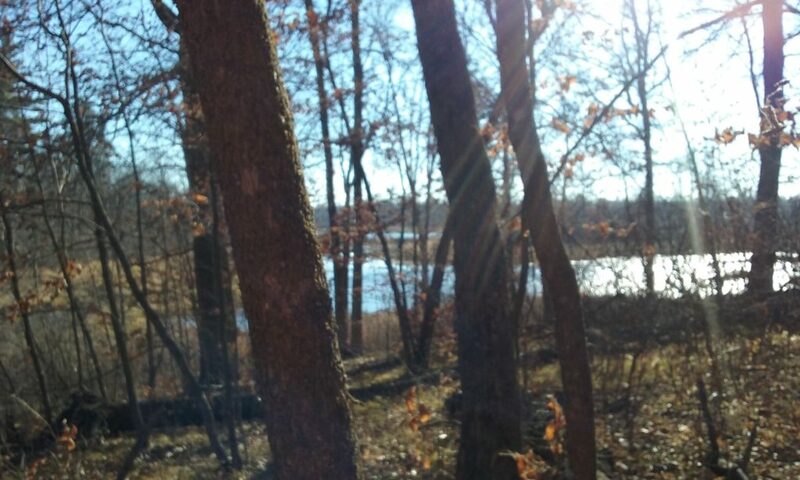 With many possible options I decided to hike over a beaver dam and sit an oak ridge that emptied down to a large slough we call the Hundred Acre Swap. It was a warm afternoon and there was still a light covering of snow on the ground where the sun had not beaten the first offering of winter back. I kept a watchful eye. 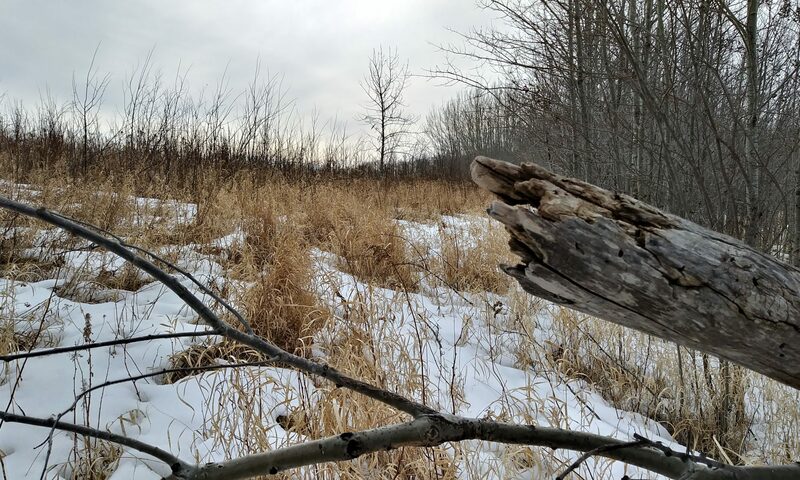 After about a mile I stepped off the trail and shifted into a still-hunt mode, working my way a couple hundred yards through low lying timber that gradually rose up to a beautiful point of land the beavers chose as a pinch point for their construction. As I neared the creek I passed a massive Norway Pine that keeps sentinel, and slipped down through the brushy edge of the water flow to the crossing. I paused and took in the amazing view. The dam had two sections. A wide channel half way through allowed a trickle of water to spill over the structure, eliminating the main passage as an option for navigation. Fifteen feet out a smaller retaining wall provided a ten-inch walk-way to the opposite side. I located a tree limb for balance which the Beavers had discarded and steadied my-self for the tight-rope act. On either side of me was a deep pool of icy darkness that would have made for a chilly swim. I used caution with each step. Once safely across I stopped and looked out over the shimmering lagoon, my gaze fell upon a small island which might serve as an isolated buck sanctuary. I considered how a canoe might serve to access the water-locked haven before I advanced up into the waiting Oaks. There were fresh deer droppings on the half-melted snow. It was quiet. A light breeze caused the old-growth forest to sway with animation. Occasionally I heard the faint clatter of two bucks sparring, but perhaps it was my mind playing tricks on me. I did not feel alone. Keeping to the shadows, I crept along the base of a hill for several hundred yards. 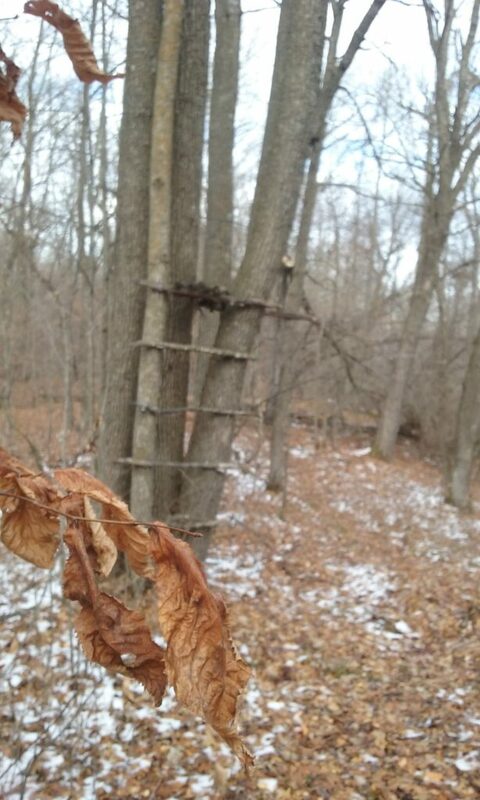 As I crested the rise I spotted an old deer-stand from bygone years. A hunter had deemed this a good spot once, so I hunkered down against a near-by dead fall that gave total sight protection to my left, and a beautiful view of another open hill and ravine in this unique formation of hard-woods and small ridges. My hopes were high. 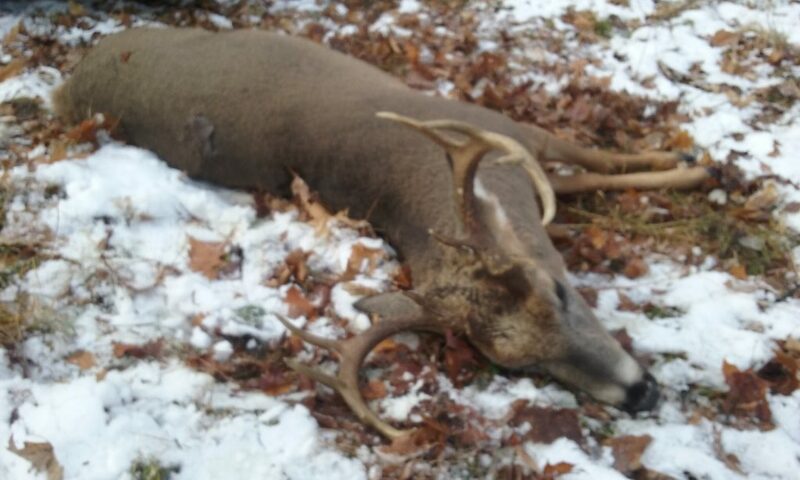 Last season I shot a big buck with my rifle another five hundred yards from where I sat. 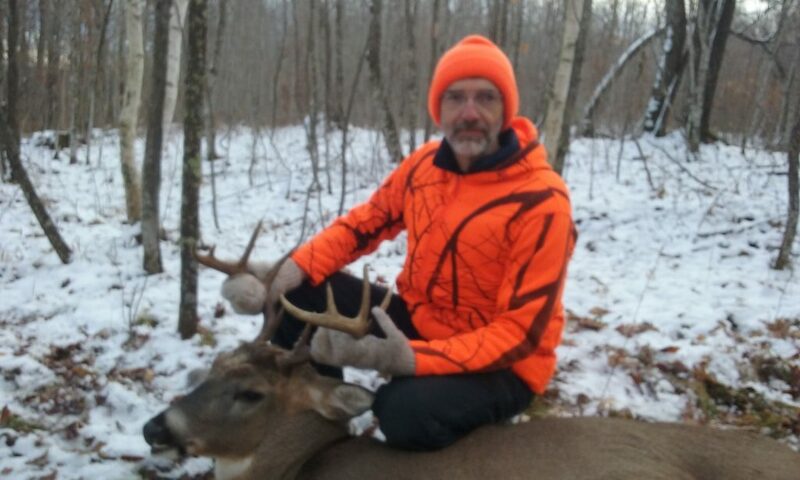 Except for the constant thought a rut driven buck could materialize at any moment, the next three hours were uneventful in my wilderness seclusion. No speeding cars, buzzing chainsaws, barking dogs, or rumbling trains. The closest reference to civilization was a distant jet far over-head. The solitude was mesmerizing. Finally, the tree-line and sky began to blend together. I pulled out every minute of daylight until the darkness fell on me like a soft veil. 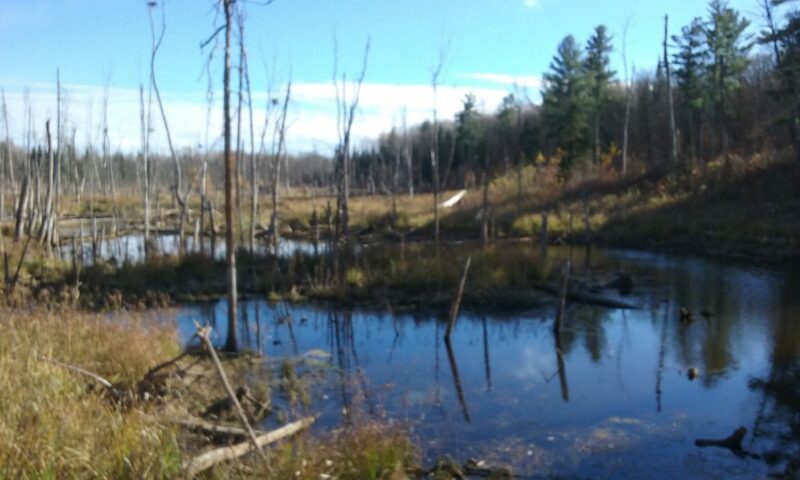 Reluctantly, I stood up and hiked back to the beaver dam. The return trip looked different in the twilight. I should have started my trek a few minutes earlier. The tangled thicket which guarded the dam crossing finally opened and I made my way down to the waters edge. The trace of daylight faded. I felt small against the gloomy silhouette of trees rising from the swamp grass across the stream. Cautiously, I stepped out onto the ribbon of mud and sticks and used my bow as a walking staff testing each footfall. 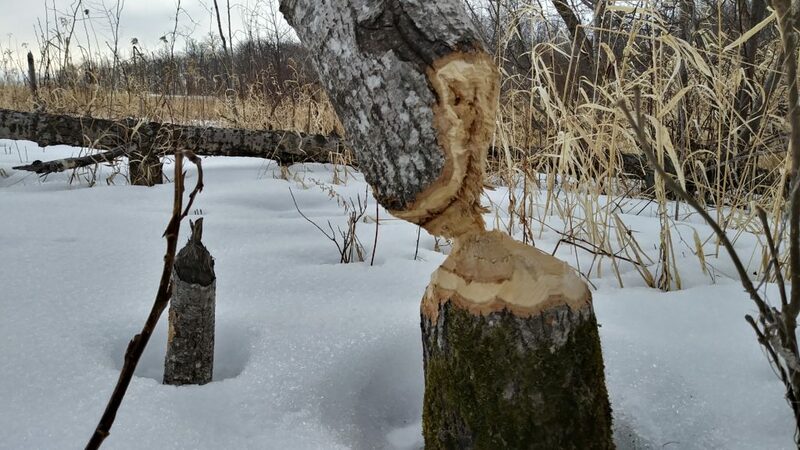 With several loud tail slaps, a family of beaver showed displeasure with me using their handy-work as a bridge to my hunting retreat. I paused to admire the waxing Moon’s light being cast onto the glassy pond. 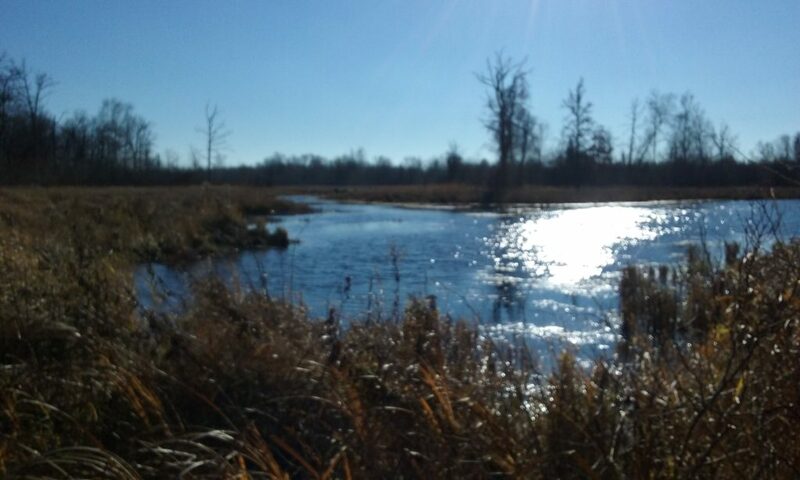 Safely across, I pushed through the tall swamp grass which hugged the creek bottom and began to maneuver around dead-falls and thick brush which impeded my progress in the hardwoods. Careful not to overshoot the sliver of trail which marked my way home, I moved slowly, illuminated in a bubble of light which emanated from my flashlight. Minutes slowed. The forest pressed. With relief, I spotted a slight depression in the sea of blackness. I found my guide home. Now, I would not get lost. The trail eluded me a couple of times. I could feel the forest floor change in texture under my boots when I stepped off the corridor. Stopping to regain the path, I continued on. After the foot-trail crossed a small dry beaver dam at the end of Ruby’s Slough, it widened and my pace quickened. Soon the landmarks became more recognizable and I was back at the road firing up my old jeep. As I strolled down the driveway our deer camp was lit up with a warm glow which mirrored off the tranquil lake. I stepped through the door and was greeted by comments about a search and rescue party which was almost sent out for me. We laughed. It was good to be back with friends. After re-living the stories of the weekend and making plans for next season it was time to load my gear and say farewell. I fought through the reluctance of leaving as I drove down the cabin road and my headlamps threw beams of light on familiar sights. 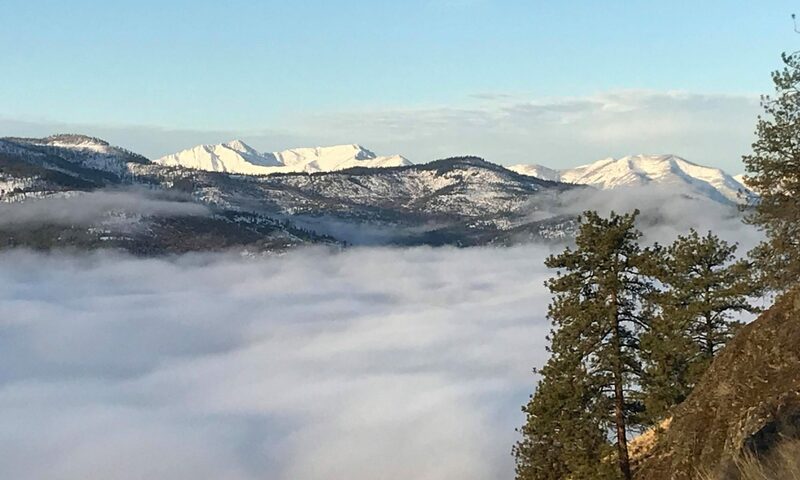 The thankfulness of another gathering and the joy of going home to my beloved bride replaced the tinge of sadness at parting the Round Lake Deer Camp. 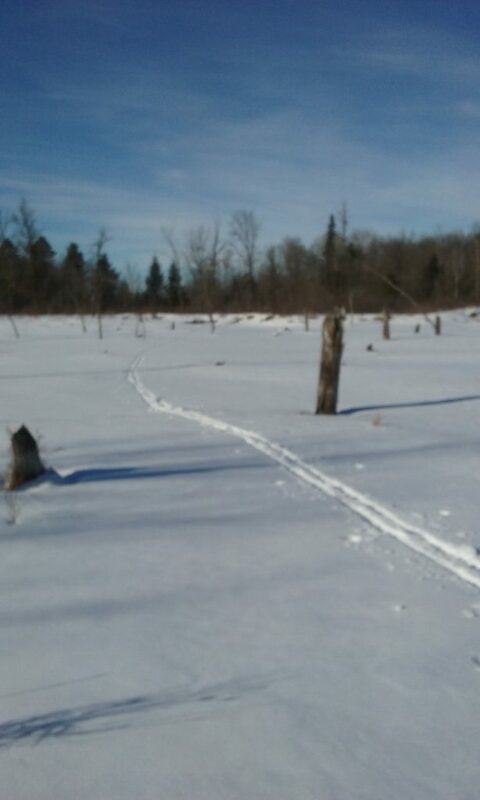 Beaver crossings can take us into many secret hunting areas. They are bridges to adventure. As you go through life be mind-full of the crossings you may discover which can lead to new and rewarding destinations, and bring adventures you never dreamed of. Which is more important, the bow or the arrow? This is a question my hunting mentor would ask me as a young man and rookie hunter. Obviously the answer is that they are equally impotant. I have considered this saying often over the years and it has helped me to keep a good balance in my life. I hope these words help you as they have me, to value, appreciate, and recognize all the people in your life that make what you do possible. Aim true & hit your mark! 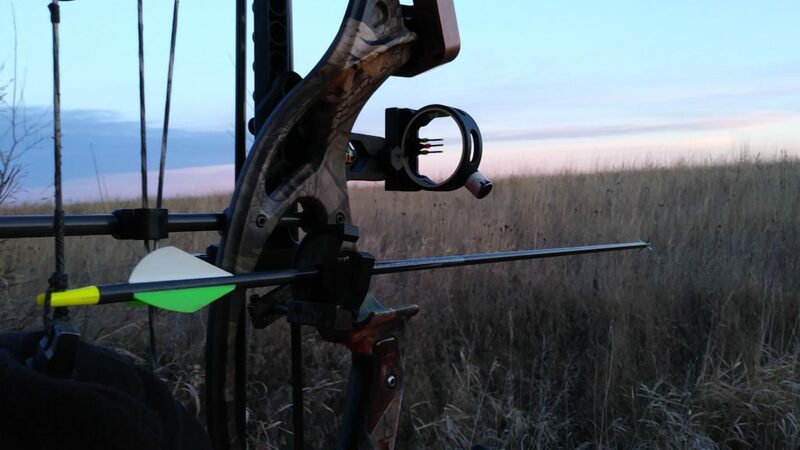 What is your favorite time of day to be in the deer stand? The early stand is ripe with wonder as morning breaks, and chases the darkness into light. 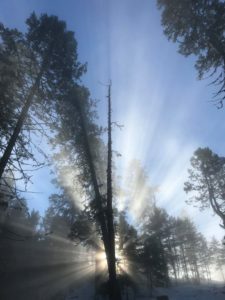 Temperatures momentarily drop while the sun begins its daytime arch and the warm blanket of air which clung to the frosty forest dissipates. 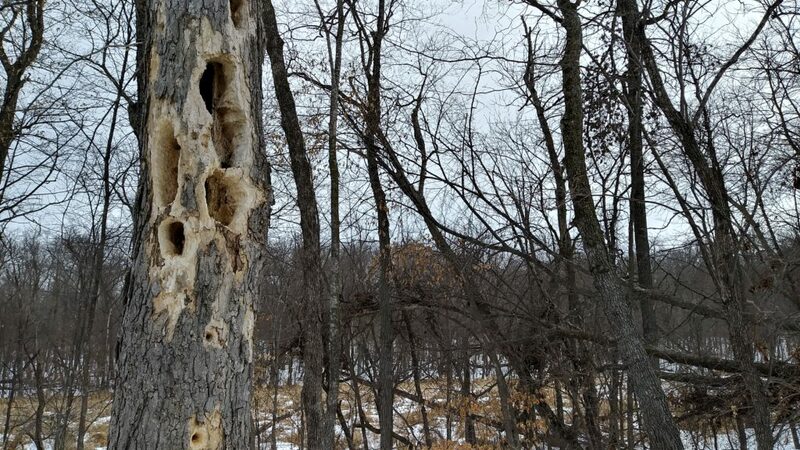 Songbirds awaken with busy, melodious chirps, and then, everything stops… out of the corner of your eye you noticed a Whitetail moving to its bedding ground and all of your senses are captured at once. The evening stand is a welcome friend after a long hunt. 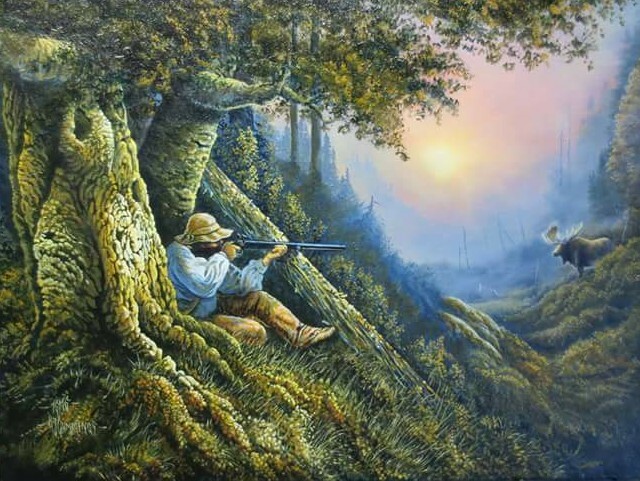 The magical transition from day to dusk evokes images of big bucks that could materialize from the brush at any moment. As night drops, the forest becomes wild again. The uncanny quiet is interrupted by a distant Hoot Owl. Suddenly, out of nowhere… cht, cht, cht, the sound of hooves, and your heart begins to race. 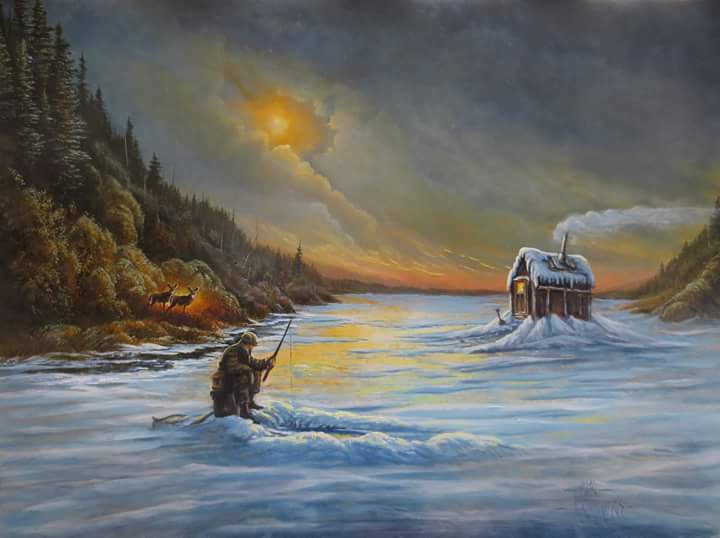 As a young hunter, I shot and field dressed my first buck in the last moments of shooting light as a harvest moon peered through a stand of Spruce. 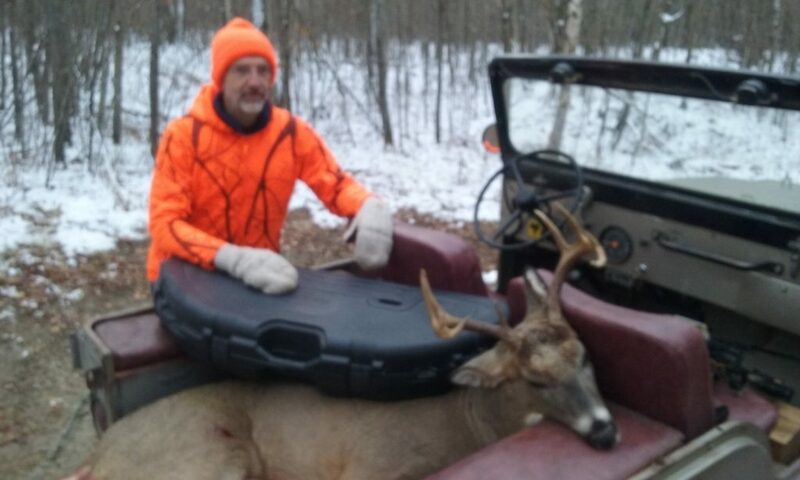 My biggest buck, as a seasoned veteran, was taken off a still-hunt from a back-woods oak point, my buddies helped float it out on a sprawling slough as another full moons reflection glimmered across the water. I love the transition from day to the long shadows which invite nocturnal creatures back to life. I love the primal feel, with weapon in hand, as I walk out of a black forest unto a logging trail that holds the last remnant of light. I love the feel of a successful hunt as I watch friends quietly emerge out of a darkened wood. I love the sunset… what do you love?